Never get stuck with self-tanner streaks again! I’m pretty particular about my self-tanner any time of year. Spring and summer may be primetime for a gorgeous glow, but I rely on a bottle bronze during fall and winter as well so I can bare my legs (or at least my ankles) without embarrassment. But cooler weather calls for more subtly sun-kissed skin (a too-dark tan screams fake in February, am I wrong? ), which is why I usually opt for a gradual tanner so I’m more in control of my color. Well, that predilection went out that window as soon as I tried The Water by Tan-Luxe. I’ve tried many tanning liquids before, but they tend to be tinted to help ensure even application. Although this fluid is crystal clear, I wasn’t at all nervous simply because it says “Light” right there on the bottle. Delivering perhaps the most effortless self-tanning experience ever, I simply sprayed it on my legs and rubbed it in with a mitt. Come morning, I had just the right amount of color to confidently step out in cropped pants and slides—with zero smell and not a streak in sight. Personal preference plays a big role in self-tanning, and I know many ladies (and men) who swear by towelettes. Among the advantages are the perfect amount of product, portability, disposability and overall ease of use. Even better, most towelettes are formulated for face and body, so you can get every square inch of your skin with just one product (especially if you have someone on hand to do your back). 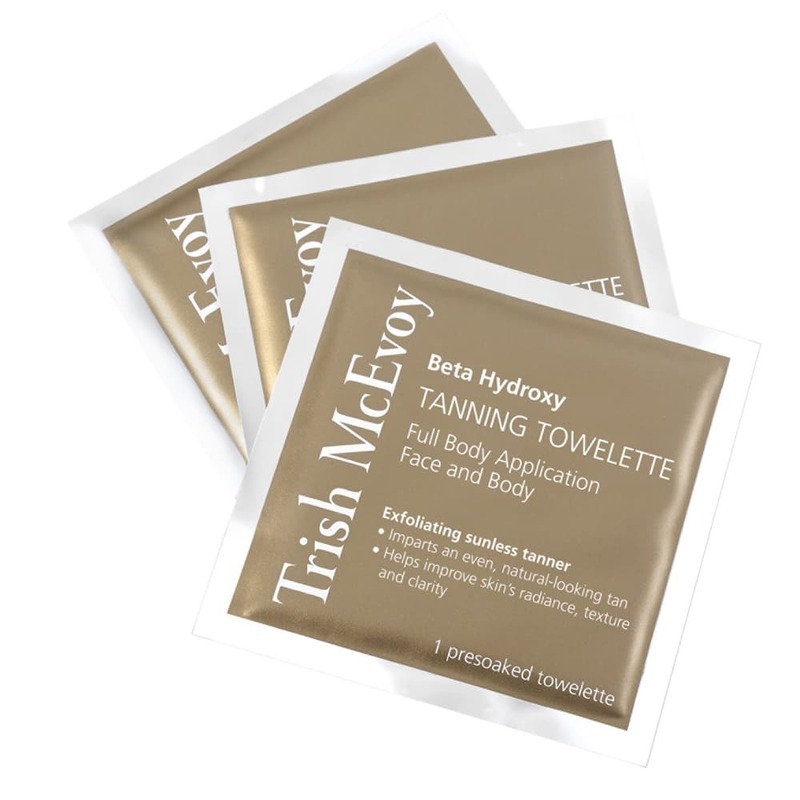 The latest addition to the self-tan towelette category is Trish McEvoy’s Beta Hydroxy Tanning Towelette, and if you like her makeup, you’ll love this newbie. In addition to sun-kissed color, these wipes feature exfoliating beta hydroxy acid that melts away the dead cells that can lead to streaks, saving you the skin-sloughing step before you apply. Toss one in your gym or overnight bag to get your glow on anytime or anywhere—and enjoy gorgeous, golden skin all summer! With Memorial Day right around the corner, it’s time to start thinking about stocking your beach bag. You should probably toss any SPF leftover from last year (be sure to check expiration dates) and start anew—and Vita Liberata’s new 3-in-1 Self-Tan Dry Oil SPF 50 is the perfect place to start. For starters, this just might be the most multitasking sunscreen out there. I love a suntan oil, and this one has a marula and monoi oil base that’s super-hydrating yet nowhere near slippery or greasy. It’s also tinted, so you get instant color that makes your pale, pasty, winter skin look gorgeously golden on your first day at the beach or by the pool. Then, as the broad-spectrum SPF 50 shields your skin from UVA and UVB rays, a natural self-tanner goes to work so you have the sun-kissed look you want at the end of the day without any of the damage. You’ll be hard-pressed to find a harder-working sunscreen for summer 2016, and I’m willing to bet you’ll blow through this bottle by the end of the season (so perhaps you should buy two). Self-tanning season is officially on! We’re about 6 weeks away from Memorial Day so it’s time start thinking about your skin as an accessory—more specifically, golden, glowing skin that you’ll be baring in the months to come. If you’re thinking that it’s too soon, consider the facts that it can take a little practice to get your self-tanning mojo back, and you don’t want to go out pale and pasty one day and as a bronze bombshell the next. The key is to start slow since summer doesn’t happen overnight (well, thanks to climate change it just might), and that’s where a gradual self-tanner comes in. I’ve been using St. Tropez’s Gradual Tan In Shower Lotion because it takes a few uses to get your glow on. After three or so easy applications (i.e. slathering it on, standing around for 3 minutes and washing it off), consider yourself ready to rock shorts and skirts. Note to St. Tropez: If you could somehow incorporate a timer into the bottle, that would be a big help. As we all know, self-tanning snafus happen, no matter how careful or experienced you may be. So be sure to have a Bronze Buffer on hand for touch-ups. These reusable sponges wipe away unwanted color instantly so you can say bye-bye to streaks and hello to a flawless, natural-looking tan. Have you put self-tanning on your calendar yet? Even if you’re not taking a trip to St. Barth’s this holiday season, you can still look like you did with a little help from James Read and his handpicked selection of products that guarantee a gorgeous glow without stepping a foot outside your bathroom. Just in time for holiday gift-giving (to yourself or someone else), The Tan Edit Face features travel-friendly sizes of all the self-tanning essentials. First, prep your skin with the Tan Perfecting Enzyme Peel Mask. Then, apply the Sleep Mask Tan Face, which offers hydration throughout the night and a subtle bronze by the time you wake up in the morning. And if you just want a touch of color (or maintain your sunkissed look between mask applications), the Tan Accelerator contains a small amount of self-tanner to speed up the process and extend the life of your faux tan. In case you’re not a believer in the year-round faux glow, think of it this way… You can hone your skills in the off-season so you’re rocking flawless results when warmer weather is upon us once again! Self-tanning sprays are nothing new, but I’ll clue you in on a little-known fact that I’ve heard repeatedly from dermatologists over the years. As the active ingredient in self-tanner produces that telltale bronze, it can generate free radicals—especially when exposed to UV light. This is no need for panic because stepping out your front door prompts the formation of free radicals. But you can minimize the damage free radicals can cause with extra antioxidants. And guess what? Hamptons Glow’s Antioxidant Sunless Mist comes with extra free radical protection built in, in the form of green and white tea extracts. So along with a beautiful (and safe) bronze, you get peace of mind, too. One of my best friends and I have had a long-standing joke that “brown fat is better than white fat”—and this strictly based on appearance (and was way before scientists revealed that there are indeed fat-burning brown fat and hormone-producing white fat). Self-tanner proves our superficial mantra, as we all know that cellulite is less visible with a bottle bronze. Enter Hamptons Glow’s Tan, Tone and Tighten Self Tanning Crème and its two powerful peptides, which work to strengthen your skin’s elasticity and actually improve your cellulite over time as it camouflages it when color develops. Self-tanning has come such a long way since a fake tan was synonymous with orange. Now you can get naturally looking color and a whole lot more—especially with Hamptons Glow! Regardless of where you live, you should not stow away the self-tanner until spring. Yes, I do realize that those who live outside of South Florida will be covered up from now until May, but you still get naked, right? Pale, pasty skin is just depressing any time of the year, and this skin-darkening duo will keep you glowing all winter long—even if you’re the only one who sees it. The good news about cold-weather self-tanning is (A), you don’t have to worry as much about streaks or mistakes and (B), you don’t have to do it as often. After playing with Vita Liberata’s Fabulous collection for the past few weeks, I have a very simple plan of attack for you—and you’ll see how easy self-tanning can be. Use the Self Tanning Tinted Mousse (I have “Medium) once a week. I love this formula because it’s tinted, and there’s absolutely no self-tanner smell. Between these sessions, use the Self Tanning Gradual Lotion in place of your usual body lotion twice a week. This combo is enough to keep your skin glowing, without looking like you’ve actually self-tanning (or been on a tropical vacation). Oh, and this little regimen also helps maintain your technique so you won’t look like a hot mess come next summer. For all of you who are concerned about chemicals in your personal care products, you’ll be happy to know that both of these products received “0” ratings from Think Dirty, which means they are “super-clean” and free of any questionable ingredients! Labor Day is six weeks out so there’s still plenty of time to get your faux glow on. These days we're all about innovative formulas that take your tanning to the next level, and here are three that we can’t stop thinking about as we head into the homestretch of summer. Our first foray into in-shower tanning was with Josie Maran’s now-unavailable product. While it was great in concept, the foaming formula had to be applied with a shower pouf, and it was so tinted that it made a big old mess in the shower. Needless to say after much initial excitement, we lost interest after just a few uses. We decided to revisit this tanning approach when St. Tropez launched their version about a month ago, and boy, what an improvement. Slathering on this white cream is a breeze, and it somehow manages to stay put on wet skin. After applying a layer, simply keep yourself occupied for three minutes and rinse it off, taking care to pat my skin dry rather than rubbing. The only downside about this product is that it’s a gradual tanner, and you may have to use it for a few days straight to see any color payoff. But with that said, it’s a real time saver and we have yet to experience any streaks or mishaps. Packed with plenty of naturally derived good-for-your-skin ingredients (such as aloe vera, camu camu, green tea leaf extract and sweet almond oil), this tinted self-tanning lotion is the bomb. The instant color is gorgeous (and slightly sparkly) and resulting faux glow is deep and long lasting. If you like facial oil and you like facial self-tanners, this product gives you the benefits of both in one. Its base of fast-absorbing, antioxidant-rich marula oil helps shield skin from environmental damage and leaves skin soft, smooth and hydrated—and the subtle tint gives you an instant sun-kissed appearance and deeper color with repeated applications. Full disclosure: We have not tried this yet, but we'll let you know when we do! Faux tan season is in full swing, and there's a brand-new way to get a gorgeous golden glow. It’s called Madame LA LA, and get ready for it to make a splash here in the U.S.! Hailing from the U.K. (as most top-notch self-tanning lines do), Madame LA LA delivers deep, dark, rich color—plus myriad other benefits for your skin. First, the tinted mousse lets you see where you’ve applied it so you can blend appropriately, and then it dries quickly so you’re not wasting time waiting to get dressed. The formula is designed to hydrate and nourish skin with coco water extract, aloe vera, green tea and vitamins A and E as color develops over the next three hours—and with proper care your color can last up to 10 days! Even more, this is a great product to use in the morning since it also contains skin-perfecting pigments along with instant color to minimize flaws as you get your glow on. Oh, and there’s absolutely no self-tanner smell, we promise! At the moment you can find Madame LA LA at Nigel Beauty Emporium in Los Angeles, but we have a feeling this bronzing brand is going to be huge here in the States! Who doesn't want to be beautifully bronzed for Memorial Day weekend?, These products give your face a gorgeous glow no matter how much (or how little) time you have on your side and it’s still early enough to get your mitts on these must-haves, so start shopping! Sometimes you just gotta glow—and when you don’t have more than a couple of hours until game time, this is the product you need. The lightweight gel absorbs super-fast and delivers a natural looking bronze in just one hour. Wash it off after 30 minutes for subtle sunkissed color or leave it for 60 minutes for a deeper tan. The color continues to develop even after the mask is washed off, but you can apply makeup and be on your way. This gradual tanner works while you sleep and delivers a steady dose of hydration, antioxidants and anti-aging ingredients at the same time. Use nightly until you achieve your desired color—and once you get there, you’ll be surprised at how long your faux glow lasts. IBB Tip: Apply to the face, neck and chest for the most natural looking effect. If you haven’t jumped on the facial oil bandwagon yet, this is the perfect time to try one. This non-greasy oil delivers a full-on tan with each application minus the self-tanner smell. Offering all of the dewiness and hydration you’ve come to expect from a facial oil, it’s an amazing way to wrap up your nighttime skincare regimen—and start your day with a healthy, bronze glow. Have you stocked up on your self-tanners for summer? What will you be using? The countdown to Memorial Day is on, and the best accessory for a holiday weekend is a golden glow. I planned this installment of my pre-summer series for today because you’re self-tanning skills may be a bit rusty after the “off season,” but with a little practice this weekend you can get your glow on for next week—and the summer months ahead! Yes, I have a spray tan machine in my house, and frankly, I couldn’t live without it. I’m sure my houseguests are a bit curious about this contraption (which lives in their bathroom), and more than one have asked to use it during their stay. The closest you can get to a salon-based spray-tan booth, the fine mist covers skin from head to toe as you follow the beeps and spin accordingly. Then with a bit of blending afterwards, you have a foolproof faux glow. As an added bonus, you get a touch-up spray with your kit as well, and it’s great for any spots that may get missed during your mist session. I’m a huge fan of self-tanning mousses because I feel like they’re the easiest to blend and control. Most of the time I like a tinted version so I get instant color, but not so much when I’m tanning at night and have white sheets on my bed. Enter Xen-Tan’s new Fresh Tanning Mousse. You get all the ease of a mousse without the tint so you don’t have to worry about staining your bedding or clothing, plus a light citrusy scent. If you have darker skin, or you just like to go deep (with self-tanning color, that is), this new Ocean Potion lotion (that rhymes!) is a fantastic budget-friendly option. You don’t get all the color at once (which is a good thing in my opinion), but after applying for three days you’ll realize that it might not be possible to get any darker. Of course you can stop beforehand if you achieve your desired color, and I get gorgeous glow after just one session. Every self-tanning “wardrobe” needs a gradual tanner. Perfect when you have the time to build your bronze, these products are much more difficult to mess up and they also trick you into moisturizing when you otherwise might not. I love Selfie Tan’N Go not only because the name is so darn cute, but because this tanner (as well as their self-tanning spray and wash-off bronzers) has never failed me. And as far as self-tanner scents go, this one is tops! Is it possible for a faux tan to last 2+ weeks? We’re always on the lookout for the next big thing in self-tanning... Name it, we’ve probably tried it, and that includes mousses, sprays, gels and lotions—both gradual and fast acting. Truly innovative products are somewhat hard to come by, so when we first saw Vita Liberata’s claim that their pHenomenal 2-3 Week Tan Mousse delivers color that can last up to 21 days, we were instantly intrigued. We picked up a sample-size at Sephora, and we couldn’t wait to give it a whirl. We were fresh out of the shower and all set to slather it on, and then we read the directions. To get this long-lasting color, you’re supposed to apply it three times. Frankly, we felt slightly scammed, because this didn’t feel oh-so revolutionary. It just felt repetitive. In terms of staying power, we can say that we didn’t even think about tanning our legs for at least a week after our first application, so that has to count for something. Although we do find the two-to-three week claim to be slightly exaggerated, we definitely weren’t running back for another tan a few days later. Our verdict: Start with a trial size because this product doesn’t come cheap ($54 for the full size), and you’ll want to make sure you choose the right shade before you invest. Oh, and when you do, make sure you have a Bronze Buffer on hand just in case! 1. You can use it on your face and body. 3. The 360-degree spray makes it easy to get your own back (and all over for that matter). 4. There’s no need to rub it in, so there’s a slim chance of streaking as long as you cover yourself evenly. 5. It’s dries super-fast, so you’re not standing around waiting. 6. The formula contains antioxidants (which is a major plus since self-tanner can generate free radicals when it’s exposed to UV light). 7. This is the only self-tanner we’ve come across that’s fortified with vitamin D, so you don’t have to expose your skin to the sun in order to get this important nutrient. 8. The end result is beyond divine. We’ll be rocking our natural-looking Brownberry tan until the can runs out! 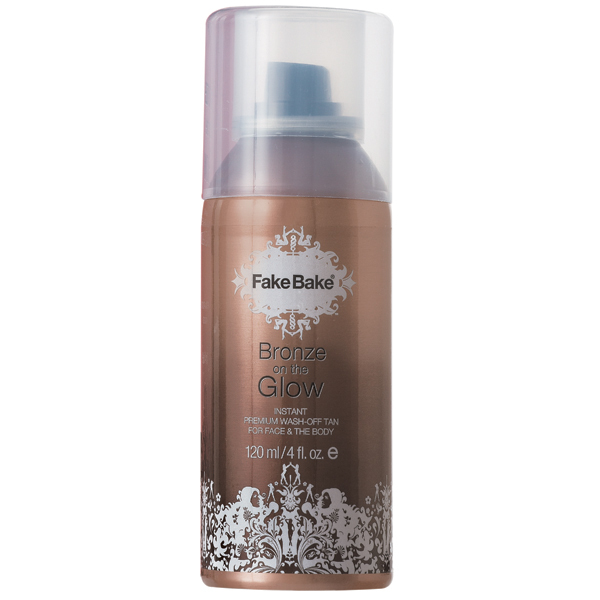 Have you tried Fake Bake yet? Platinum Face: Apple stem cells are where it’s at for skin rejuvenation these days, and this facial lotion gives your skin a treat as it tans. We love the tinted formula that gives us instant color. Bronze on the Glow: When time is of the essence and you just don’t have time for color to develop, this aerosol mist comes to the rescue. An instant bronzer that washes off easily, it also contains cucumber extract to hydrate the skin and antioxidant green tea to help ward off free radical damage. Tantalizing Self-Tanning Butter: Perfect for dry legs, this super-hydrating cream is rich in skin-soothing shea butter and offers a light tan at the same time. Its sheer bronze color helps you avoid streaks and keeps legs (and anywhere else you use it) smooth and soft all day long. Nobody’s perfect, and we’re all guilty of making beauty blunders on occasion. So long as they aren’t permanent (like silicone injections), here are a few easy fixes that will help you undo the boo-boos and get back on track. So you picked a pimple and now you’re left with a scab. To get healing on its way (and prevent infection) apply a topical antibiotic like Polysporin twice a day, and cover the blemish with a good concealer. I like a lightweight formula that doesn’t get cakey, such as M.A.C Select Cover –Up. The only thing worse than being a hairy mess is getting burned by too-hot wax—but there are a few ways to soothe the discomfort and prevent discoloration. Ask your doctor for a prescription for Xclair. (This is good to have on hand for any type of burn.) You can also break open an aloe plant and apply the gel to your burn as well. Since many skin types are prone to discoloration after burns (or other injuries) heal, make sure to apply at least SPF 30 to the affected area to prevent darkening that can be difficult to fade. Men and women alike experience uncomfortable irritation after shaving (albeit in different places), but the solution is the same. Wash the affected area with a gentle anti-inflammatory cleanser and apply 2.5% cortisone to soothe the inflammation. If razor burn is a chronic problem for you, consider laser hair removal—or Tria’s at-home system—to prevent the ingrown hairs that lead to irritation. Sure, some self-tanners are better than others, but the end result is highly application dependent. Unless you’re a pro (and even professional spray tans can wind up with streaks if you put your clothes on too soon), odds are you’ll end up with color somewhere you don’t want it, like on your palms. Regular self-tanning can also lead to build-up on the knees, ankles and around the feet, and I never really had an easy solution until I discovered Bronze Buffer. Simply wet these little sponges and wipe away streaks—it’s that easy. We’ve all been there, but it’s possible to decrease the time you have to live with a bad haircut. Start taking Viviscal (I sell the Professional version in my office and I think it’s more effective than the original) as soon as possible, and pick up 2.5% minoxidil at the drugstore. (It’s sold under the Rogaine brand name, but it’s available as a generic as well.) This combination treatment helps your hair grow faster. Professional-grade spray tanning at home! As the creator of Bronze Buffer, I’m somewhat obsessed with faux tanning--and I’m here to tell you that I found something that changes EVERYTHING. I reserve professional spray tans for special occasions since I’m always trying new products for my daily beauty blog, InsiderBeautyBuzz, but Tropic Spa has created a system that gives all of us the best of both worlds. This at-home mist machine is absolutely brilliant, and this is going to be my go-to for a gorgeous faux glow for the foreseeable future. I decided to experiment the same day it arrived on my doorstep, and set up shop in my guest bathroom just in case in turned out to be a big mess (fortunately it didn’t). After spending about 15 minutes putting it together and inserting the tanner-filled aerosol cans, I put a towel on the floor of the shower, hung it over the shower door and adjusted it for my height. Since it was my first time trying it, I committed to following the directions to a tee, hence the plastic gloves and shower cap (I had shower caps on my feet, too)—which are all included with the full system. From there, all I had to do was press the button a few times, and do a little “spin” to make sure the mist covered my entire body (face included). After 12 seconds of mist, I used my hands to rub in the tanner, waited a few minutes for it to dry before putting on my robe, and that was it. It's not as complicated as it looks. When I woke up in the morning, I couldn’t believe my eyes—or my nose, because there was no self-tanner smell. The results were amazing, and there were only a few spots in need of a touch-up (Bronze Buffer to the rescue). The only thing I’d do different next time would be using one of those velour mitts that come with many self-tanners for blending, rather than the plastic gloves. The system itself is cordless, but you do need to charge it before the first use. Each set of cans provides 10 tans, and refills for the system (also with 10 tans) will run you $100—a fraction of the price you pay at a salon or spa. The formula itself is only available in one shade, but it was perfect for me. The company suggests tanning every five to seven days, and says that it’s impossible to overdo it, since the color will be the same even if you use it four or five days in a row. In a nutshell, this is possibly the easiest, most affordable way to rock a gorgeous faux glow year-round. If you’re even slightly into self-tanning, do yourself a favor and buy this system. I already have a list of friends who want to come over and try it out, and I’ll bet (and hope) they get their own after seeing the incredible results for themselves! Most of us know that self-tanners work by creating a chemical reaction that darkens the uppermost layers of skin, but you probably didn’t know that your skin’s pH plays a crucial role. (Improper pH is directly responsible for a dreaded orange hue.) Amino acids are an essential part of the equation as well, since these protein building blocks work hand in hand with the active ingredient in self-tanner (DHA) to give skin a golden hue. So it makes sense that boosting the level of amino acids would maximize self-tanning results, and that’s exactly what Norvell’s Pre Sunless XLATAN pH Balancing Spray does. The first time I tried the pH Balancing Spray, I followed it with Norvell’s new Venetian Sunless Mist. Designed to deliver a darker tan with instant violet and brown bronzers, you can see exactly where you’ve sprayed to make sure you get a nice even application. The fine mist dispenses just the right amount of tanner (read: no dripping) and it was completely dry after a light buff-and-blend courtesy of a tanning mitt. This tanner also happens to smell fantastic. In fact, my husband told me I smelled like a tanning salon, and even though I haven’t stepped foot in one of these skin-cancer boutiques in 20 years, I knew exactly what he was talking about. The result was amazing… Come morning, I had a lovely bronze color that usually takes two applications of other self-tanners, and I had barely any boo-boos. My feet are always problematic, but after a few minutes with my Bronze Buffer, my golden gams were pool-party ready!